Answers of I. Purnell Pendleton to the Additional Cross Interrogatories on the part of the Petitioner. 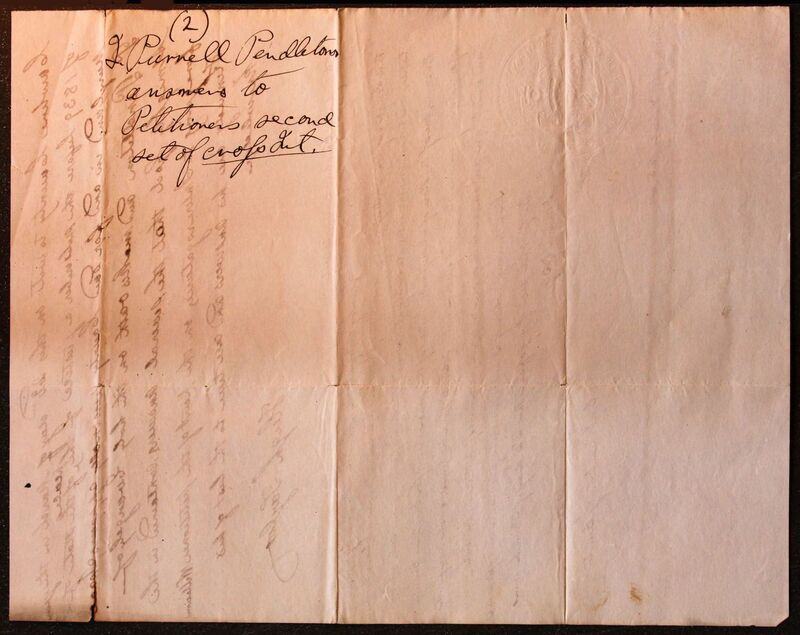 To the first additional Cross Interrogatory this deponent answereth and saith, that in a former answer he stated that his Aunt Miss Purnell opposed his taking the petitioner to Virginia with him (the deponent) and was aware that he (the deponent) was taking the petition from Maryland, and used no other means than earnest persuasion[? ], as no other means were in her power at the time. To the 2d Cross Interrogatory. This deponent answereth and saith that Miss Purnell had full knowledge of the fact that the Petitioner was with the deponent in Virginia, and used no coercive means to have him returned to Maryland, but from time to time earnestly urged this deponent to send the Petitioner back to Maryland. To 3d Cross Interrogatory. This deponent answereth and saith, that Miss Purnell was in Virginia, and knew this deponent had the Petitioner in his possession. And that she took no other means to recover the Petitioner than earnestly to urge this deponent that the Petitioner should not remain in his (the Petitioner) present situation. To 4th Cross Interrogatory. 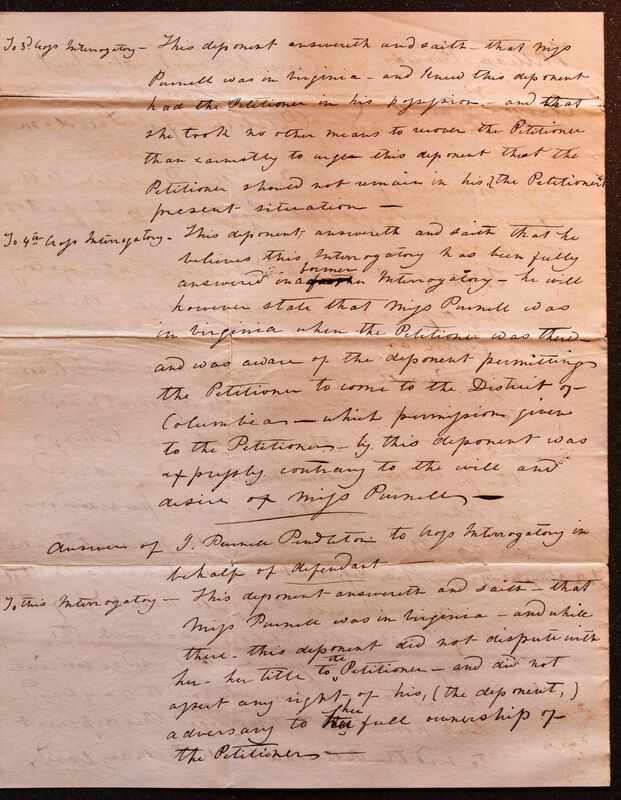 This deponent answereth and saith that he believes this Interrogatory has been fully answered in a fourth former Interrogatory, he will however state that Miss Purnell was in Virginia when the Petitioner was there, and was aware of the deponent permitting the Petitioner to come to the District of Columbia, which permission given to the Petitioner by this deponent was expressly contrary to the will and desire of Miss Purnell. To this Interrogatory. 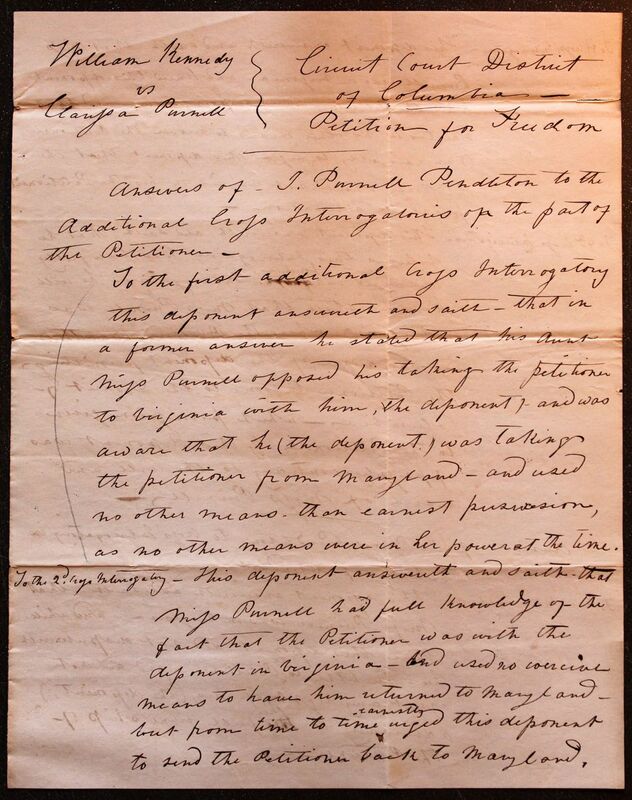 This deponent answereth and saith, that Miss Purnell was in Virginia, and while there, this deponent did not dispute with her, her title to the Petitioner, and did not assert any right of his, (the deponent,) adversary to her full ownership of the Petitioners. 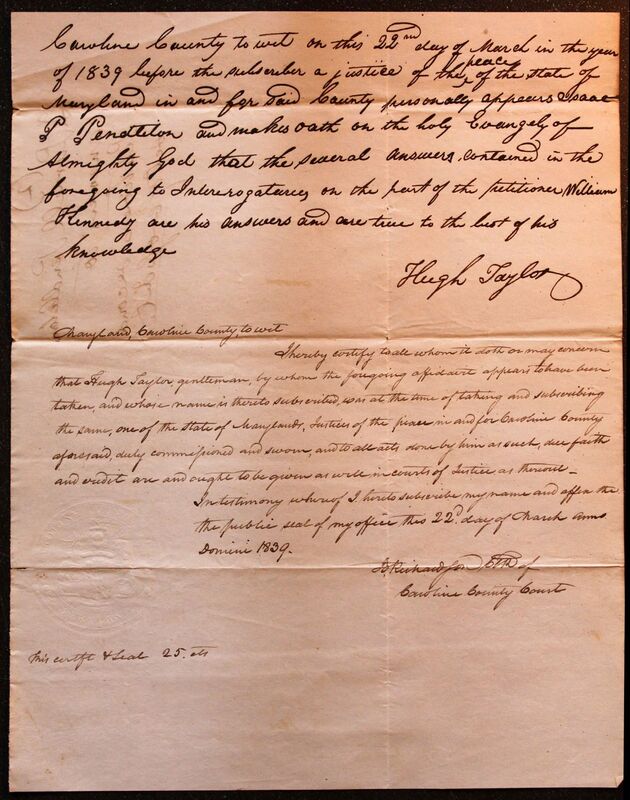 I hereby certify to all whom it doth or may concern that Hugh Taylor gentleman, by whom the foregoing affidavit appears to have been taken, and whose name is thereto subscribed, was at the time of taking and subscribing the same, one of the state of Maryland, Justices of the peace in and for Caroline County aforesaid, duly commissioned and sworn, and to all acts done by him as such, due faith and [illegible] are and ought to be given as will in courts of Justice as thereout. In testimony whereof I hereto subscribe my name and affix the the public seal of my office this 22d day of March Anno Domini 1839. I. Purnell Pendleton answers to Petitioners second set of Cross Int.